Most people never even think twice about plugging a premium piece of AV gear or an audiophile power conditioner into a cheaply made wall outlet. You are not getting the full potential from your system if you neglect to upgrade this vital interface between your system and your AC household power grid. AudioQuest's NRG Edison is an audiophile-grade duplex power receptacle that replaces the standard poor-quality AC receptacles that the vast majority of us have in our homes. Superior design and metallurgy make NRG Edison a must-have addition to your AV system or other gear. NRG Edison features polished high-tension surfaces with hanging-silver plating, ensuring the lowest distortion of any plated or clad material. Signal-masking radio frequency noise is efficiently transferred toward your utilities transformer and earth ground—far from your sensitive components. 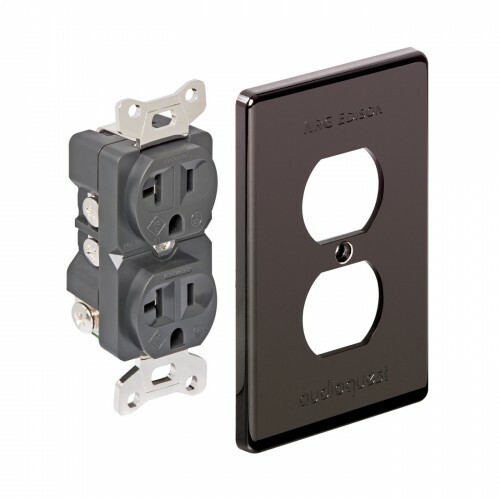 Compared to standard 'hardware store' AC wall receptacles, the NRG Edison has significantly greater metal mass and grip for optimum current delivery. This includes the receptacles’ retention blades, as well as the critical ground, wire, and spade lug connections. No other AC outlet can boast such low impedance for optimum current delivery. Even the base metal of the NRG Edison is first class. The beryllium-copper base metal provides superior spring tension and long-lasting, low-impedance AC power connections. Typical materials such as brass, or even high-purity copper aided by spring and wedge devices, simply cannot equal the unparalleled retention strength of high-mass beryllium-copper.